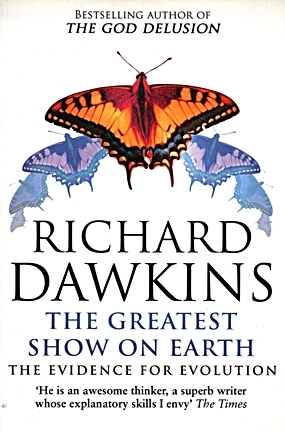 This week’s book The Greatest Show on Earth (ISBN 978-0-552-77524-3, Black Swan publishing 2010) was written by Richard Dawkins, the author of many previous books, including The God Delusion. One may correctly guess that certain demographic groups would be ready to crucify this writer, as after all he is promoting heresy. Or is he? Author Dawkins deals very effectively with the biased readers and shows the (I believe terrifying) statistic that around 40 percent of adults in the western world believe that “God created human beings pretty much in their present form at one time within the past 10,000 years or so.” That was from a Gallup poll in 1982. Has the western world progressed since then? A 2006 poll by the Horizon BBC group showed that although 48 percent of respondents believed in evolution, there was still a very sizeable percentage that followed the 10,000 years and created by God dogma. It is comforting to know that Adam and Eve were just so recent in the world’s history! Dawkins also derides the appellation “Darwin’s Theory of Evolution”, stating quite categorically that it is no longer a “theory”, it is a fact. He does, however, accept the “fact” that around 40 percent of westerners have closed their eyes to this fact. I found this book just fascinating, both for the subject matter and the method of delivery. Not that I needed selling on Charles Darwin’s work, but the detail that Dawkins gives is just so compelling, that it should be made compulsory reading for the creationists. Would you believe there are people who believe that man co-existed with dinosaurs? One person interviewed by Dawkins came out and states, “The philosophy of evolution can lead to ideologies that have been so destructive to the human race…” I would love for this person to show me where. There are still those who wear blinkers, and even the holocaust deniers (who get a mention in the early part of the book as well), who most likely will also be part of the 40 percenters. Diagrams, photographs and other data are dotted throughout the book, making it a most comprehensive scientific work, though it remains a very readable text all the way through it. At B. 495 it is a wonderfully written educational book. 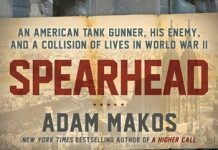 The humor that comes through stops the book from being a heavy intellectual treatise, but he does give Notes, Bibliography and Further Reading references at the end of the book. Make sure your teenage children read this book. I would like to think we can do something about the 40 percenters. And if you are one, please do not write hate mail to this newspaper, but just go and get “The Greatest Show on Earth” and read it. It will be the best B. 495 you’ve ever spent.